St. Patrick's Day Celebration The Greens At Centennial Campus. Saturday, March 11th, was a day to be a proud Irishman, even if it was just for the day! 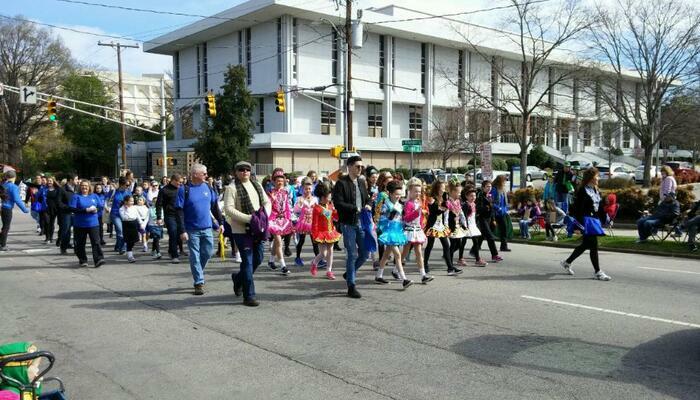 The parade began in downtown Raleigh around 10 AM and lasted until 12 PM. Green was all around us, so it was only fitting that The Greens represented! For those who didn’t have a chance to join, we decided to share some of our favorite St. Patrick Day highlights below! “Top of the morning’ to you!” It wouldn’t be St. Patrick’s Day without the good ‘ole leprechaun himself making an appearance. Girls of all ages from multiple Irish Dance Academies gathered together in beautifully decorated Irish Dance Dresses. This dance academy in particular really caught our eye! It wouldn’t be a parade without our furry friends! The Neuse River Golden Retriever Rescue was one of many dog rescue groups that came out to show their Irish pride. Lastly, National Miss 2016 Kelly Glendenning came out in a gorgeous, emerald green dress showing her support for the Irish! How are you showing your green today? Wishing everyone a safe & Happy St. Patrick’s Day!